Scroll through a fun collection of Walt Disney Stamps. You will find Christmas Winnie the Pooh Stamps, Mickey Mouse Stamps . . . Even an Eeyore Christmas Stamp. All in their Christmas best. Each Disney Christmas Stamp is available in three sizes and all denominations. 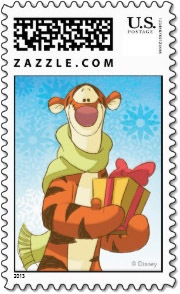 Click any Disney Christmas stamp for a closer look. 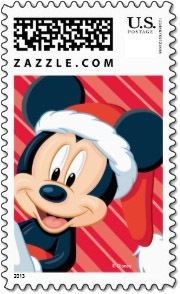 This Disney Christmas postage stamp has Mickey Mouse dressed in his Santa suit. 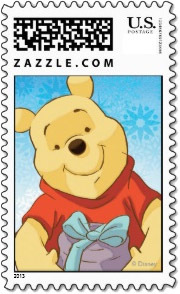 Winnie the Pooh Christmas stamp has the all stuffed with fluff bear delivering a Christmas present. 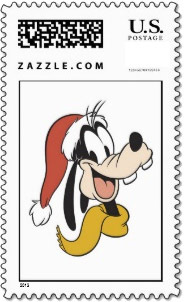 Goofy looks very styling is his red Santa hat on this vertical Disney Christmas stamp. 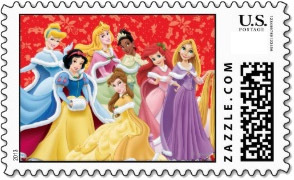 All of the Disney princesses on one Disney Christmas stamp including Cinderella, Snow White and the Little Mermaid. 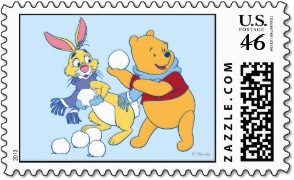 Winnie the Pooh and Rabbit have a snowball fight with their friends on the next Disney Christmas stamp. 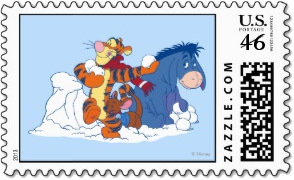 Tigger, Roo and Eeyore have a snowball fight with Winnie the Pooh and Rabbit in the Disney Christmas stamp to the left. 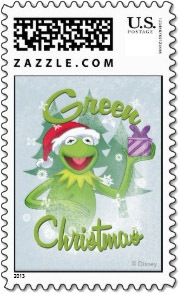 Kermit the Frog wishes you a Green Christmas on this Muppet Christmas stamp. 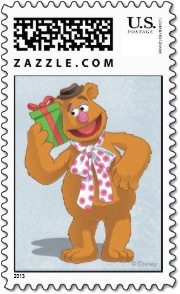 Fozzie Bear is happy to get a Christmas present on this Muppet Christmas stamp. 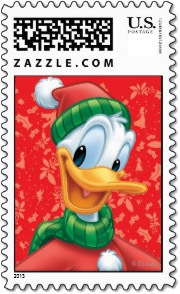 Everyone's favorite quacker is dressed for a blustery day in this Donald Duck Christmas stamp. 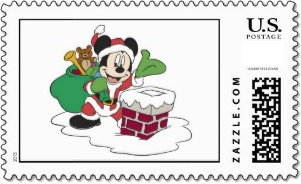 Mickey Mouse looks out on this Disney Christmas stamp wearing a Santa hat. 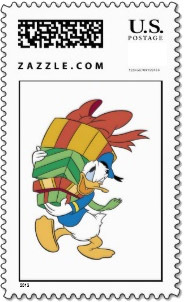 Donald Duck is delivering a too heavy load of presents on this Disney Christmas postage stamp. 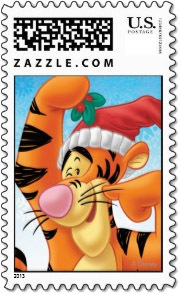 The wonderful thing about this Tigger Christmas stamp is that he's the only one. 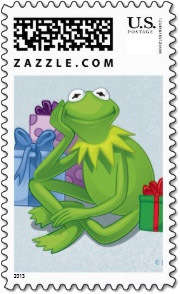 Kermit the Frog sits among Christmas packages on this not easy being green Disney Christmas postage stamp. 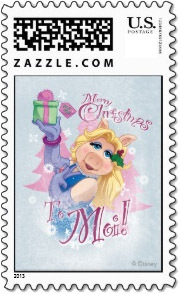 Miss Piggy is dressed to the the nines on this Disney Christmas stamp as she declares Merry Christmas to Moi. 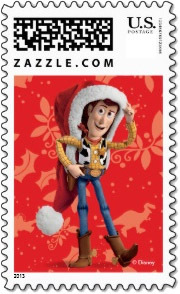 Toy Story's Woody the cowboy looks out from underneath a too large Santa hat on this vertical Toy Story Christmas stamp. Winnie the Pooh, Tigger, Piglet and Eeyore dressed in Santa hats. Cute Disney Christmas stamp. That playful pooch Pluto helps decorate the Christmas tree with dog bones. Young children will love this Disney Christmas stamp. 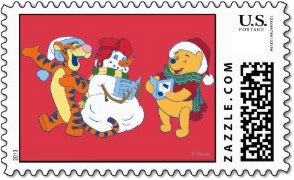 Winnie the Pooh, Tigger and their snowman friend sing Christmas carols on this colorful Disney Christmas stamp. 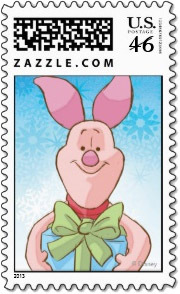 Tiny Piglet delivers a big package on this cute Disney Christmas stamp. 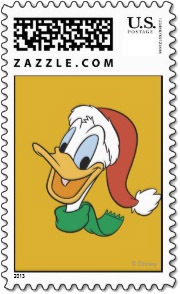 The famous duck ports and Santa hat in this Donald Duck Christmas stamp. 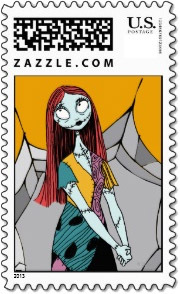 Sally stands in front of a spider web in this Nightmare Before Christmas stamp. 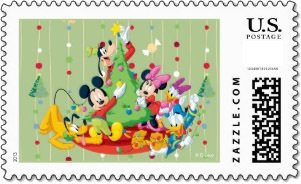 Mickey Mouse, Donald Duck, Goofy and all the Disney gang are decorating their Christmas tree on this fun Disney Christmas stamp. Mickey Mouse and Minnie Mouse dressed in the holiday best fill this fun Mickey Mouse Christmas stamp. Mickey Mouse plays Santa Claus with a bag of toys and a snowy chimney top. A fun Disney Christmas stamp. The ever lovable Tigger holds a sprig of mistletoe over his head and points to his cheek where he would like a kiss. A fun Disney Christmas stamp. 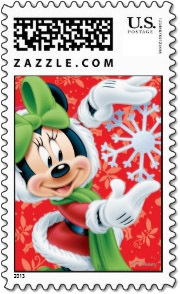 Minnie Mouse Shows off a snowflake on this red Disney Christmas stamp. 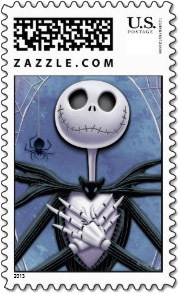 From The Nightmare Before Christmas, Jack Skellington is love on this Disney Christmas stamp. Winnie the Pooh and the shy Piglet exchange Christmas gifts on this Disney Christmas stamp. 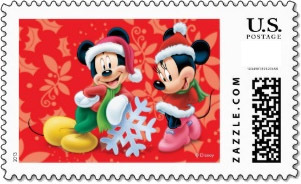 This Disney stamp has Mickey and Minnie are dressed in Santa outfits against a red snowflaked background. Vintage Mickey and Minnie with gifts under the tree. Retro Disney Christmas stamp. Goofy is dressed for the snowy weather in this classic Disney Christmas stamp. 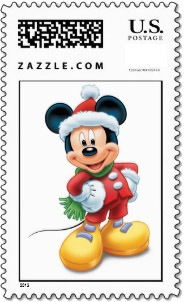 A smiling Mickey Mouse dressed in a Santa Claus suit fills this Disney Christmas Stamp. Tinker Bell dressed in her Christmas best holds a snowflake against a soft red background of this Disney Christmas stamp. Miss Piggy dressed in a Santa suit and provocatively posed on this Muppet Christmas stamp. Jack Skellington from "The Nightmare Before Christmas" fills this Disney Christmas stamp. Mr. Incredible pops through a Christmas wreath in this incredible Disney Christmas stamp. Smiling Eeyore is wrapping a Christmas present on this Disney Christmas postage stamp. 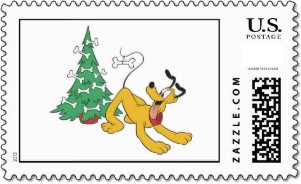 A happy Pluto in a green scarf against a red snowflaked background makes a classic Disney Christmas stamp. Kermit the Frog in a Santa hat and holding a purple present. Soft snowy background on this Muppet Christmas stamp. 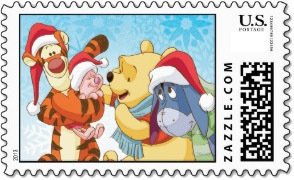 Winnie the Pooh and friends build a snowman on this Disney Christmas stamp. Lock, Shock and Barrel from "The Nightmare Before Christmas". A fun and almost spooky Disney Christmas stamp. Mickey Mouse totes a green bag full of toys for good little girls and boys as he plays Santa on this Disney Christmas stamp. For most any occasion, fun mailing products you will not find at the Post Office. Discover wedding postage stamps by color, month and theme. Create your own stamp for bat or bar mitzvah invitations in the Mitzvah Postage Stamp Collection. Plus, an extensive collection of Vintage Christmas Stamps and fun Halloween stamps for your seasonal greetings. Something else you won't find at the Post Office, this collection of funny change of address postcards.